The U.S.’ Homeland Security department may soon be using a technology developed by Defence Research and Development Organization (DRDO) to detect explosives, after it proved a success in insurgency and militancy affected areas in India. The DRDO today signed a Memorandum of Understanding (MoU) with US-based firm Crowe and Company LLC to further develop the Explosive Detection Kit (EDK) to meet the standards set by regulatory institutions in America, before introducing it in U.S. Army and Homeland Security forces. Developed by DRDO’s Pune-based High Energy Material Research Lab (HEMRL), EDK can detect explosives of any combination based on TNT, dynamite or black powder. “The testing requires only 3 to 5 mg of suspected sample. It comes packed in a box the size of a vanity case and in miniature vials that can be kept in shirt pockets. 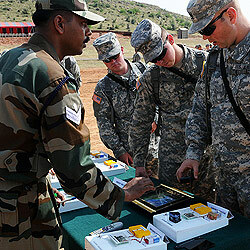 It contains reagents capable of detecting explosives, even in extremely small quantities,” a DRDO spokesperson said here. S Sundaresh, Chief Controller R&D, Armaments & Combat Engineering, stated that the technology is very effective and is in use by Indian security forces and would now help the international community also. The technology is being widely used by the Bomb Detection Squads (BDS) of the Indian Army, paramilitary and police in Jammu and Kashmir, Assam, Maharashtra, Gujarat, Andhra Pradesh and Tamil Nadu.